Hartford, 1781. Near Fine. Two documents as follows:1. Small Autographed Document Signed by Joseph Isham, Jr., Daniel Foot, and Abraham(?) 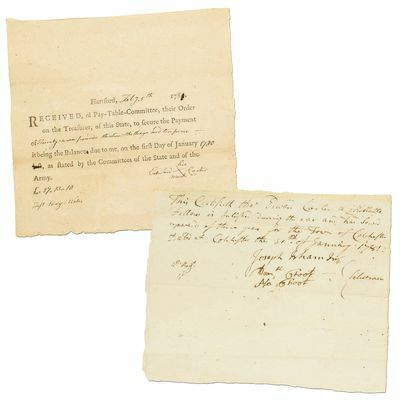 Foot, as Selectman of the town of Colchester, Connecticut, and dated 31 January 1781, stating that "Edward Carter, a Mulatto Fellow is enlisted during the war and has served upwards of three years for the Town of Colchester." Approximately 7.5" x 6" on laid paper with partial watermark. Very near fine.2. Partially printed pay receipt dated 5 July 1781 Signed by Edward Carter with an "X" ("Edward Carter, His Mark X"). Certifying that Carter was paid twenty seven pounds for his service. Approximately 7" x 6.75" on laid paper. Very near fine.The story of Carter is compelling. Edward Carter was a veteran of the French and Indian War and enlisted in 1777 along with several other freemen and several slaves who were freed for the purpose of serving Colchester and Connecticut in the War. Additionally, his four sons also joined. Carter served in combat in Germantown in Philadelphia, participated in the failed defense of Ft. Mifflin on the Delaware, and wintered at Valley Forge with Washington. The following year, he participated in the Battle of Monmouth when Washington overtook the British there, and wintered again with Washington at White Plains, where he was reunited with his sons. In 1779 he participated with all four of his sons in the successful overthrow of the British works at Stoney Point near the Hudson River. After this Carter worked fortifying West Point and was present for the hanging of Major John Andre. He served in New England until the end of the War.Interesting and uncommon documentation of a black soldier who fought, along with much of his family, for the duration of the Revolutionary War. Moebs. Black Soldiers p. 259; Rose and Brown. Tapestry, a Living History of the Black Family in Southeastern Connecticut p. 12-18.